The engine that powers the HondaJet is the GE Honda HF120. The HondaJet engine is specifically named the GE Honda Aero Engines HF120-H1A. General Electric (GE) and Honda teamed up to create the Honda HondaJet engine by creating GE Honda Aero Engines LLC, a new aircraft engine manufacturer. Their focus was to create a new business jet engine that would power the HondaJet and other business jet aircraft. 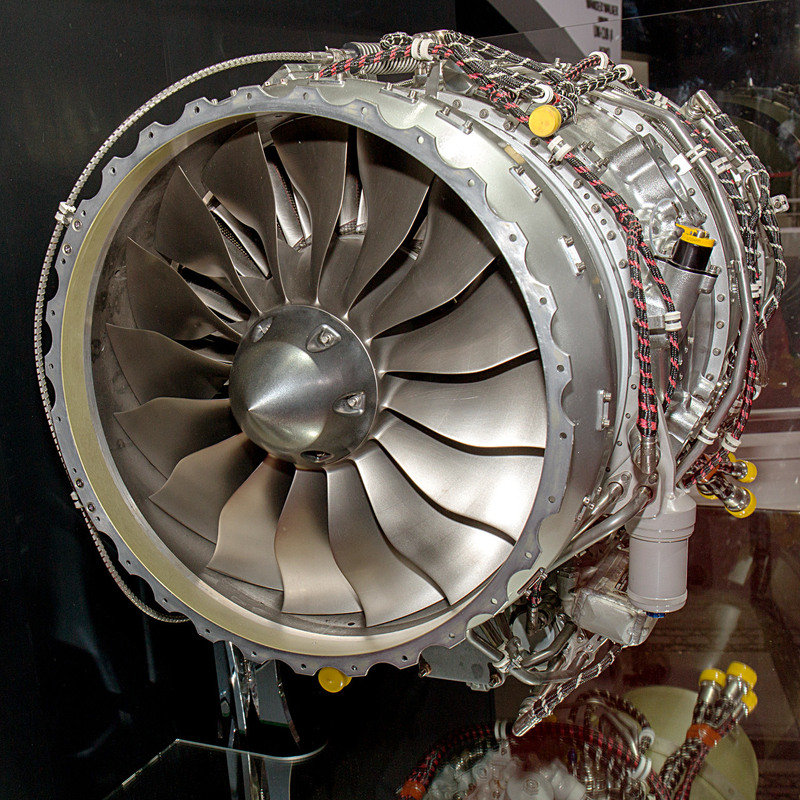 GE Honda Aero Engines completed this task by creating the GE Honda HF120 turbofan jet engine. The GE Honda HF120 will also power the Spectrum Freedom business jet when the program advances forward. Specifications for the engine are listed at the middle of this article. Above is a photo of the Honda HondaJet Engine the GE Honda Aero Engines HF120-H1A. Original photo by Morio on Wikimedia Commons. Above photo is a modified version that has been enhanced by FlyRadius. Photo is released under a Creative Commons Attribution-Share Alike 4.0 International license. 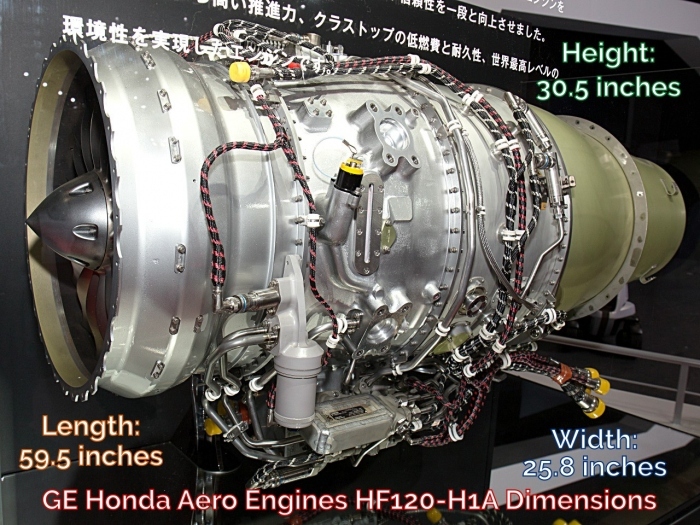 GE Honda applied for an engine type certificate for the HF120 on February 27, 2007. The company finally achieved certification of the engine on December 13, 2013 as the engine received a type certificate from the Federal Aviation Administration (FAA). GE Honda Aero Engines and Honda Aircraft Company built a new production facility in Burlington, North Carolina to produce the GE Honda HF120-H1A jet engine for the HondaJet. The company’s headquarters location is currently in West Chester Ohio, however. In October 2011 Honda Aircraft experienced some problems with ice ingestion on HondaJet Engine when flight testing the HondaJet. GE Honda Aero Engines was able to eventually fix the problems with the engine. GE Honda first began production of the engine at GE's plant in Lynn, Massachusetts and then moved production to GE Honda Aero Engine's production and overhaul facility in Burlington, North Carolina. The North Carolina facility received a production certificate from the FAA on March 17, 2015, which allowed the company to begin full production of the engines in North Carolina. Below you can learn about the HF120-H1A engine’s specification and dimensions. Our team has derived this information from the engine’s type certificate and information published by GE Honda Aero Engines. Below we have gathered the HondaJet’s GE Honda Aero Engines HF120-H1A engine specifications. Information was collected from the FAA type certificate for the engine and information published by the engine manufacturer. Weight: 466 pounds (Includes basic engine, basic engine accessories, and optional equipment as listed in the manufacturer’s engine specifications). Takeoff Thrust: 2095 pounds at sea level, static thrust, 5 min*) *The normal 5-minute takeoff time limit may be extended to 10 minutes for engine out purposes. Maximum Accessory Power Extraction: 24.2 horsepower (hp) at the SG pad. Capable of performing up to 45,000 feet or Flight Level 450. Noise: Achieves CFR36 Stage 4 requirements with margin. Above is a photo of the GE Honda Aero Engines HF120-H1A with dimensions. The original photo is by Morio on Wikimedia Commons. The above photo is a modified version that has been enhanced by FlyRadius. Photo is released under a Creative Commons Attribution-Share Alike 4.0 International license. An additional suffix or ending can be added to the engine model number (HF120) to identify minor changes in the engine configuration, installed components, or de-rated thrust for a specific aircraft. The HF120 engine for the HondaJet is an example of an engine using this naming system. Below is further information on the differences between the base engine and the -H1A. HF120-H1A: Same as the HF120 except for reduced thrust ratings to accommodate HondaJet power management. All limitations are identical except as listed below. There are minor hardware differences to accommodate different aircraft installation positions (left, right) and/or additional/optional equipment. Maximum continuous: 1922 pounds at sea level, static thrust. Takeoff (5 min): 2037 pounds at sea level, static thrust. The HondaJet and its engine are know by other names that are used to identify the aircraft. Below is a quick overview on the names. Honda Aircraft HA-420 Engine: The HondaJet is officially known as the HA-420. Aviation regulators use the name HA-420 to identify the aircraft. Some may refer to the engine as the Honda HA-420 Engine. Honda HDJT: HDJT is the 4 place alphanumeric identifier for the aircraft the FAA is using this code to identify the aircraft for air traffic control operations. HDJT is also the ICAO identifier for the light jet (likely). Some in the industry may call the engine the Honda Aircraft HDJT engine, however, this less common that the HA-420 name. To learn more about the HondaJet please visit the other pages that are located on the site.